Primary mediastinal B-cell lymphoma (PMBCL) is now recognized as a distinct clinicopathologic entity that is principally diagnosed in adolescents and young adults (AYAs). 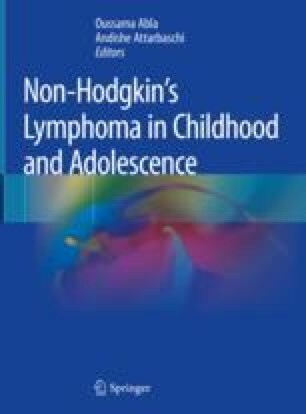 Its clinical, morphological, and biological characteristics overlap significantly with those of nodular sclerosing Hodgkin lymphoma (NSHL). Recently, the common biology of these two entities has been highlighted across several studies and mediastinal gray zone lymphoma (MGZL), with histologic and molecular features intermediate between PMBCL and NSHL being recognized as a unique molecular entity. There is lack of consensus regarding the optimal therapeutic strategy for newly diagnosed AYA patients with PMBCL, but highly curative strategies that obviate the need for mediastinal radiation are favored by most. Recent refined understanding of the biology of PMBCL has paved the way for investigating novel approaches such as targeting CD30, immune checkpoint inhibition, and adoptive T-cell therapy. Wöessmann W, Lisfeld J, Burkhardt B, NHL-BFM Study Group. Therapy in primary mediastinal B-cell lymphoma. N Engl J Med. 2013;369(3):282. https://doi.org/10.1056/NEJMc1305983.